At the end of the fifteenth century, Renaissance artists had opened the way for an expansion of ideas but the direction art would take was not clear until the latter part of the century that followed. Whereas Renaissance artists retained a connection to classicism, the art that began in the late sixteenth century and lasted until mid-eighteenth century – referred to collectively as “Baroque” – moved beyond classicism into an area of drama and fantasy. During this time the boundaries of art were pushed and the classical images of the Renaissance gave way to exuberant and ornate forms. Often painting, architecture and sculpture were coordinated for dramatic effects that tended to overwhelm the senses. It was a time when technical difficulties did not stand in the way of artists. Light and shadow, perspective, foreshortening, and virtually all other problems dealing with the creation of an illusion of three dimensions on a surface had been overcome. Artists could give free reign to their ideas and imagination. In 1624, Nicolas Poussin, left Paris to settle in Rome and through his work became the most renowned French artist of the seventeenth century. In subject matter, he became attracted to mythological as well as real life heroes of ancient Rome and although it was a time when art tended to be full of unbridled activity, his work tended to be restrained; his working methods were deliberate. When asked about his well thought out compositions, he said, “I am forced by my nature towards the orderly.” During the mid-1630s, in addition to painting subjects from mythology and history, Poussin turned his attention to subjects from the Bible. 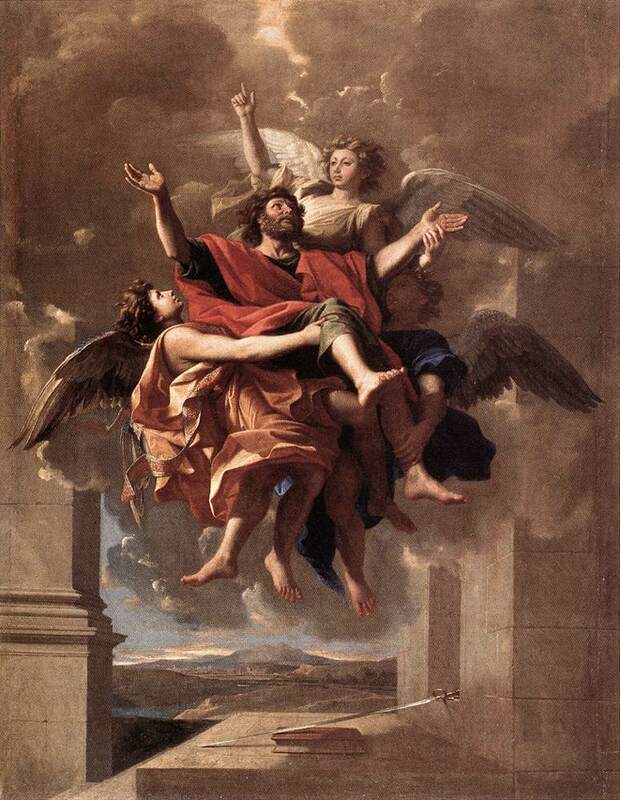 In The Ecstasy of St. Paul, Poussin depicts Paul being escorted by three angels as he starts his journey heavenward. The lead angel is pointing the way. In organizing this composition, Poussin was faced with a problem of how to deal with so many arms, legs, and angel’s wings. He resolved the problem by having some of the limbs out of sight and connecting others by touch. Paul, in the center of what seems to be an entangled scene, is in a laid-back position with arms raised. The angel on the left has a hand under the knee of his right leg. The angel on the right, whose face is in shadow, has a hand on the ankle of Paul’s left leg. The uppermost angel is touching his left hand lightly as if to guide him upward but no real lifting is being done. The angels are there primarily to accompany Paul while a sweeping landscape and billowing clouds serve as a backdrop. Below them are the symbols associated with Paul; a book that represents the word of God and a sword. The sword indicates he was at one time a persecutor of the Church and then, after his conversion, took up the Sword of the Spirit; the bound book refers to his epistles. “Baroque” first came into use as a somewhat derisive term. It was used in France to mean something unusual, bizarre, or even poorly made, but the source of the word is unclear. It may have come from the Spanish word berrucco for an irregular (uncultured) pearl or from the Portuguese barroco for hilly or uneven ground. The root of these words may be from the Latin verruca meaning a slight flaw. In view of the turning, undulating, and convoluted shapes found in a great deal of Baroque art, any of these suggested origins are plausible.